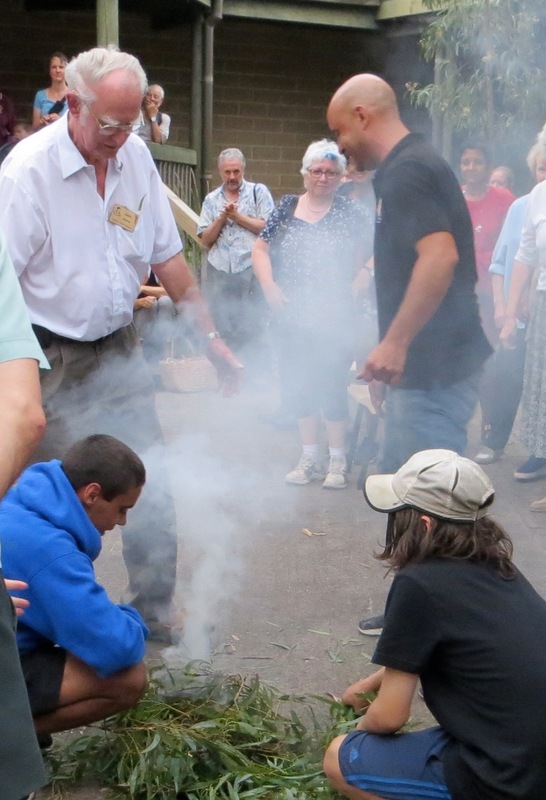 Our programs have been developed and chosen to provide enriching opportunities for young people in the community, from preschoolers to young adults. NYSF – National Youth Science Forum for Year 11 students. This program helps students who aim for career in Science. 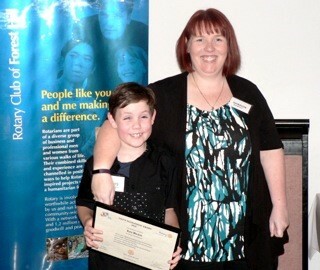 YAA – Primary Schools Youth Achievement Awards. 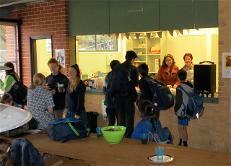 Acknowledging Year 6 students who are local ‘unsung heroes’. 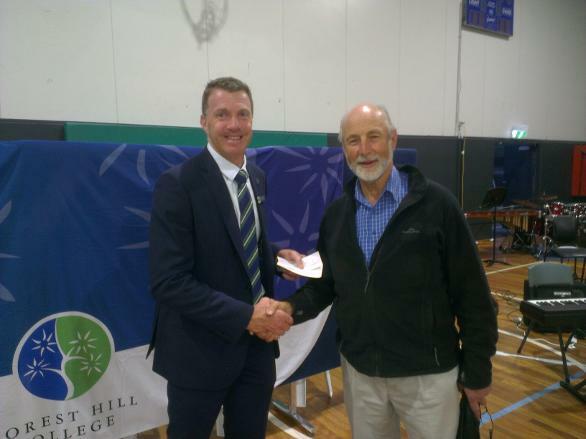 Gary Davis presented a cheque to Principal David Rogers at the school Assembly on behalf of the Davis brothers, Roger, Peter & Gary. 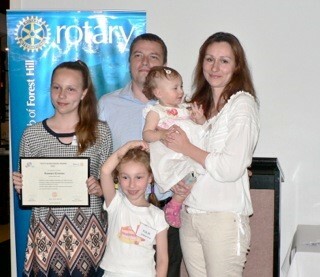 This was to fund the Ford Davis scholarships to James and Zoe who were chosen by the school. Ford Davis was the founder of the Rotary Club of Forest Hill. 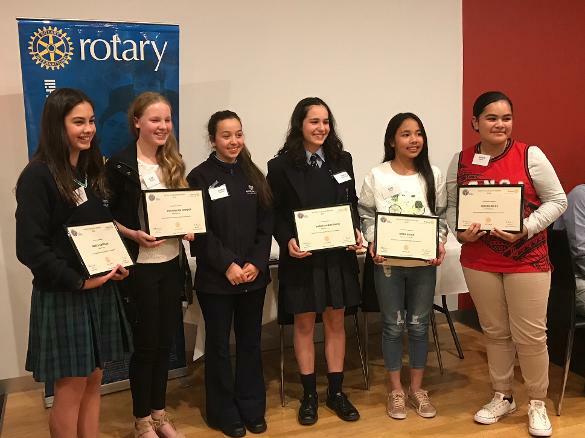 Twelve primary schools from our local area again took part this year in our unique program – the RCFH Youth Achievement Awards. Our club initiated this idea in the District 34 years ago and to date we have handed out 336 awards. These students are chosen by the school for their hard work, enthusiasm in helping others and their overall contribution to school life. 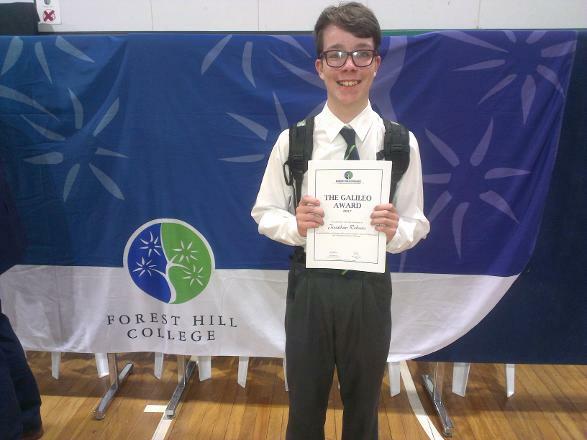 Our Speaker Thomas Yakubowski, a year 11 student at Box Hill High, captivated the audience, congratulating the students on their achievements at such an early age. He suggested the students investigate all programs Rotary offer and see what they can use to their advantage. 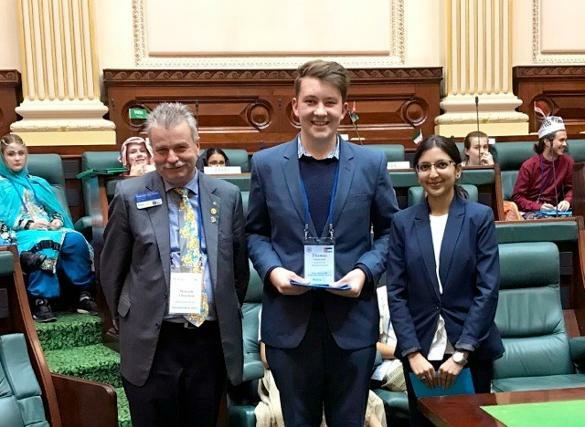 Thomas and his team member Aashna Shah won District 9810 MUNA 2018 (Model United Nations Assembly) and then came third in the National MUNA competition. This has opened up all sorts of opportunities for them. 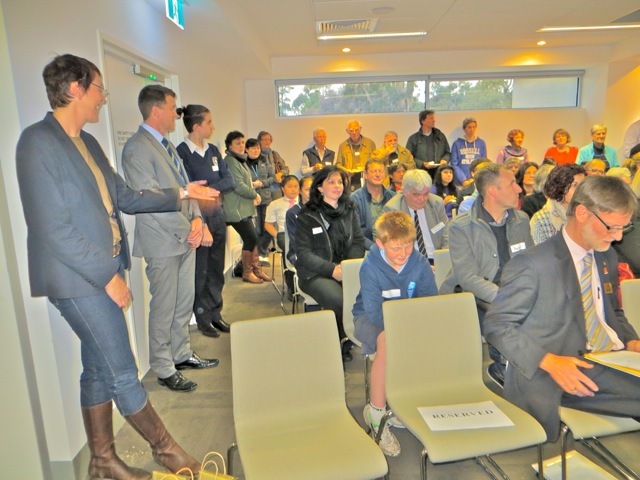 The 12 wonderful awardees were Mitchell (Livingstone), John (Burwood Heights), Amy (Orchard Grove), Jenny (Whitehorse), Abby (Rangeview), Oscar (Vermont), Xavier (Mt Pleasant Road), Thomas (Blackburn Lake), Kate (Weeden Heights), Sheena (Vermont Special School), Rhys (St Timothy's), and Jonte (Parkmore). 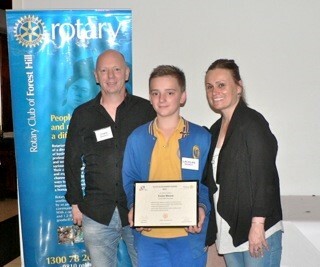 The Rotary Club of Forest Hill gave each student a framed certificate, the school worded citation and a voucher. 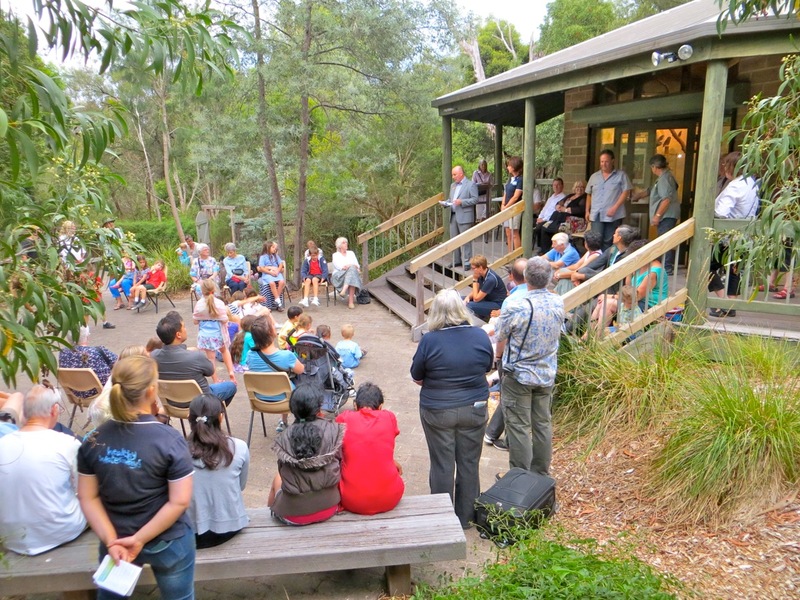 Our District 9810 Assistant Governor Joan Young handed out the awards watched by an enthusiastic audience that included the parents of the students, their siblings, other family members, Rotarians and their partners. Each of the citations was read out and was greeted with very warm applause. Official photographs were taken and later distributed to schools and parents, but there were also plenty of photo opportunities for others, both during and after this friendly ceremony. 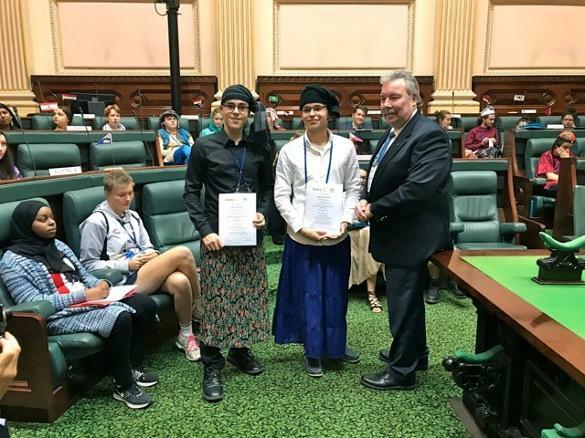 Each year, three students from Box Hill High School receive an award to help and encourage them to further their education. 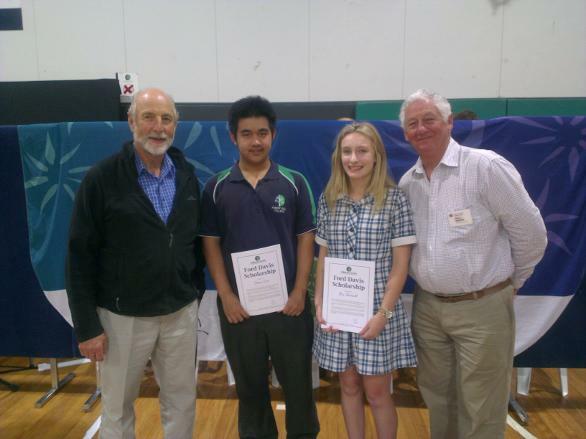 They each receive $1,000 at the start of yr 11 and another $1,000 at the start of yr 12. This year the awardees were Ashley Beh, Anita Nguyen & Rock Wilkins. Since 2010-11, 21 students have received this award. 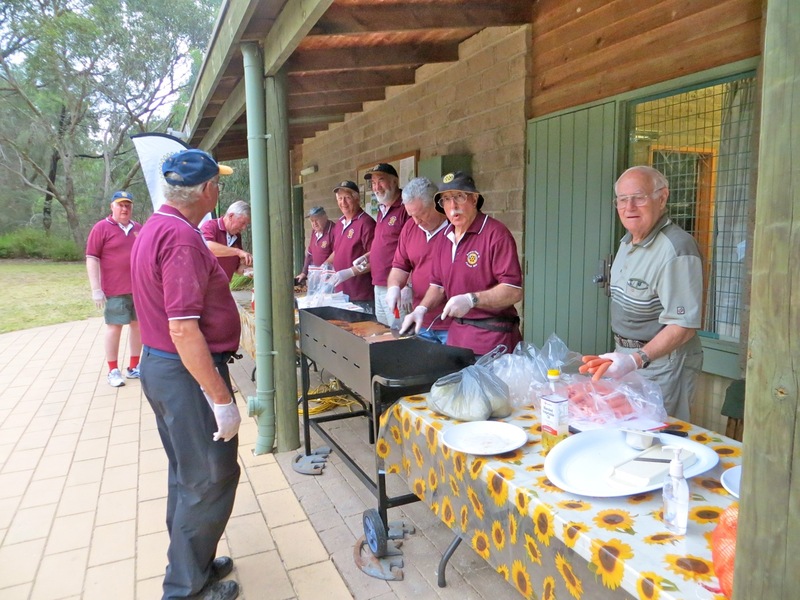 It is financially supported through the Gysi-Davis Trust in fond memory of Ford Davis, a foundation member of our club paid for by his three son's who attended Box Hill High School. 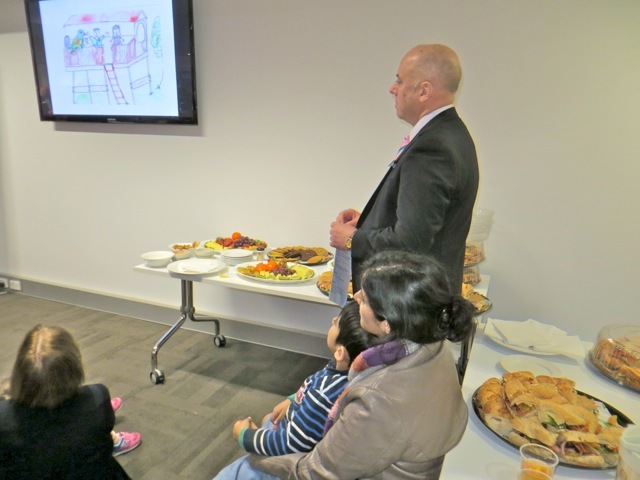 Gary Davis was present at out club meeting on the 27th March to speak to the students and hand out the awards. Gary described the awards as "the red hot go award" encouraging them to make the most of their opportunities. Each student then spoke on how the money would be used. 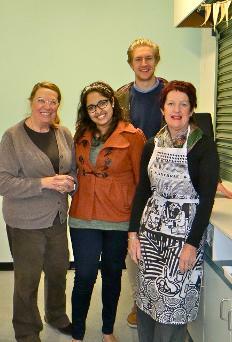 Glenys, Robbie, Ben, and Sonali dishing up a healthy breakfast for students at Forest Hill College. Here is a photo of the 2018 DISTRICT 9810 Speech Contest FINAL. Andrew (6th from the right) came 3rd in a very close call. The first three were separated by a very narrow margin. 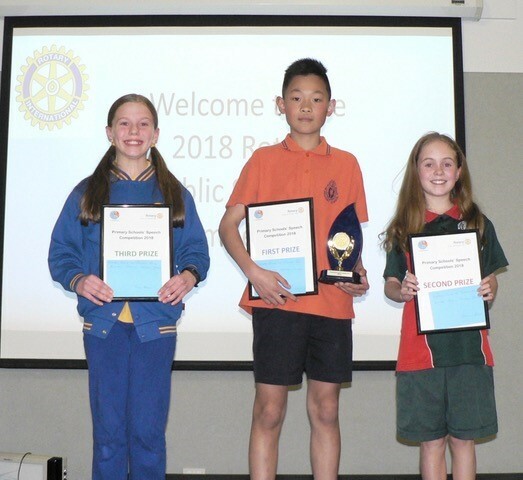 Mount Pleasant Primary School won the sixth Primary School Speech Contest our Rotary Club has organised, run on the night by MC Bill Marsh and our Youth Committee. Once again Toastmasters (a big thank you Marlene Sinclair co-MC, chief judge Cate Press, & judges Lilian Poke, Judith Talanoa ) provided the adjudication. 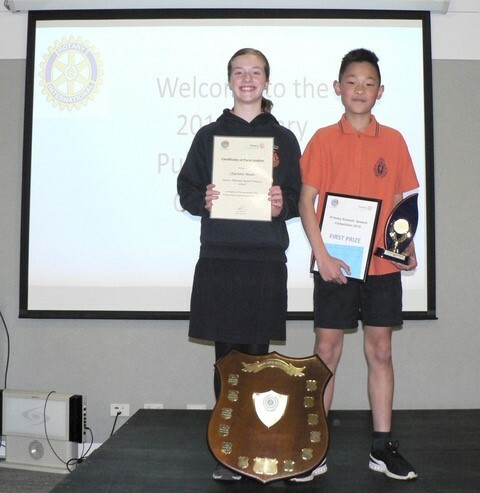 As last year's winner, Mount Pleasant Primary School hosted us with fourteen students from seven local schools, our largest gathering todate, spoke on a variety of topics for 3 minutes. The children amazed the audience with their poise, confidence, and preparation - many speaking without notes, and some with objects (elephant, bars of chocolate! and a slide show background). 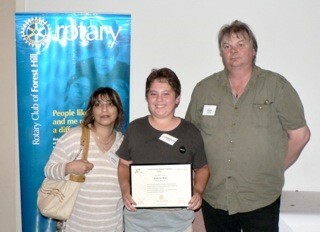 Andrew (Mount Pleasant) was the winner with Anju (Blackburn Lake) the runner up and Rachel (Burwood Heights) 3rd. Topics included • Was that a spaceship, What food would you like to eat for every meal, and My secret life as a heroine. 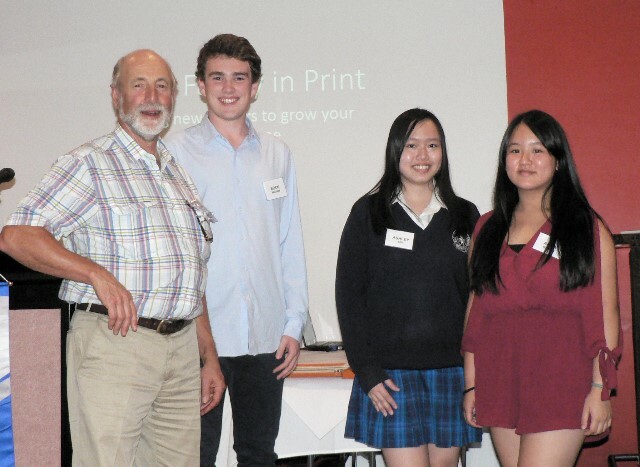 The winners respectively received prizes of $50, $40, & $30 vouchers plus a certificate. 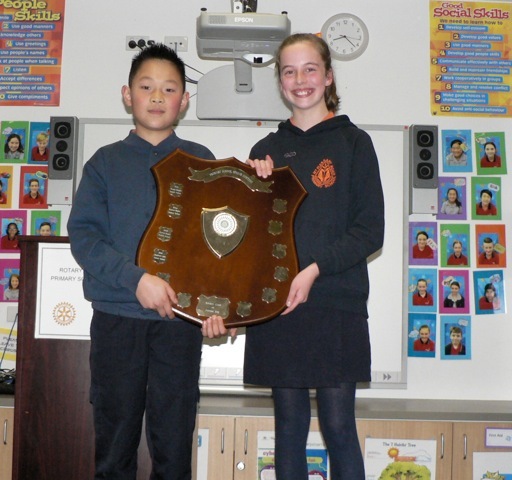 The winner also received a trophy while the school gets to display the Perpetual Trophy for a year. 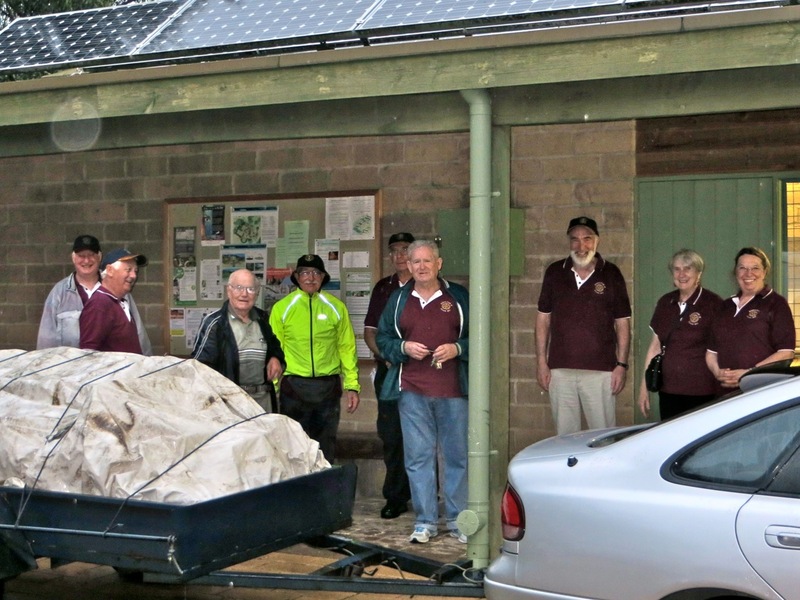 Presentations were made by the Rotary District Elect Shia Smart and the club's Assistant Governor Joan Young. 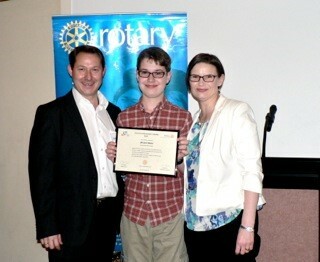 Note: Andrew won last year as well as a grade 5 student! 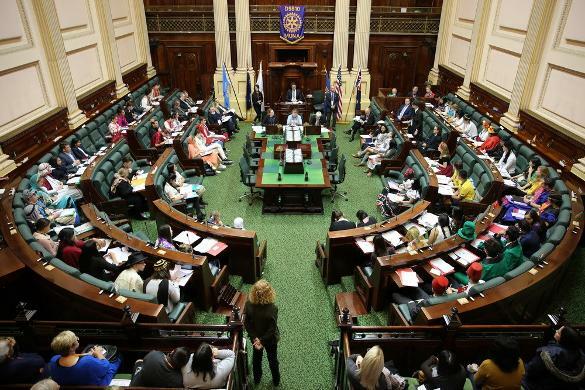 For the 20th time since the first MUNA event held in 1999, we were fortunate to be able to hold MUNA in the magnificent Legislative Assembly Chamber of the Victorian Parliament House. We should never underestimate the impact on the students of this elegant historical building, the atmosphere of the place, and the fact that the students are actually sitting and working in the seats occupied by our lawmakers. This year 38 teams took place representing 38 countries in. 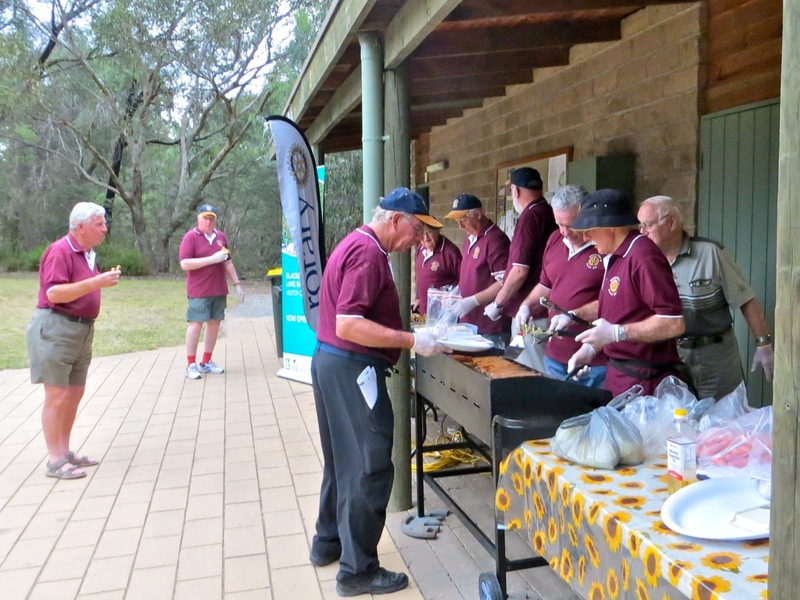 The Rotary Club of Forest Hill sponsored two teams from Box Hill High School. The one representing Jordan was judged as the best performing team of the weekend. 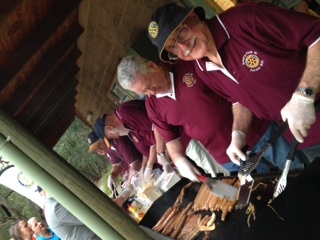 They will be attending the National MUNA event held in Canberra in August. Our second team represented Myanmar also did very well. Other teams which won awards were from PLC (North Korea- runners up and best costumes), St Bede's (Pakistan- District Governors Award), Salesian (Thailand-best student resolution). Lewis Douketis and Diego Marchillanda, above, represented Myanmar. They received their Certificate of Participation from DGE Russell Gurney. 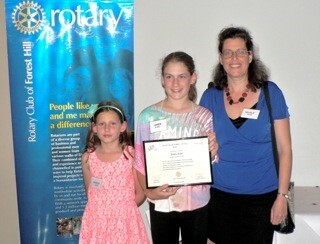 WE HAVE GIVEN OUT OVER 300 ROTARY YOUTH ACHIEVEMENT AWARDS TO OUR LOCAL SCHOOL CHILDREN! 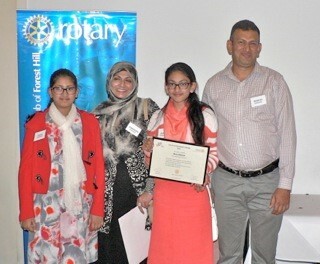 This year the Rotary Club of Forest Hill presented its 326 award since inauguration to deserving District Youth Achievers, or ‘unsung heroes’. 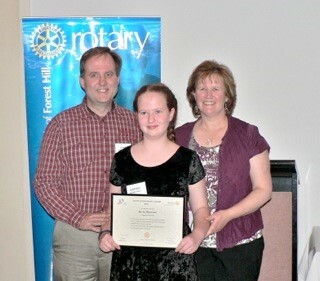 Each year since 1978 the Rotary Club of Forest Hill has presented awards to one student in Year six at each Primary School located in the south east corner of the City of Whitehorse. 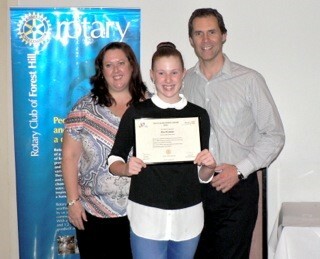 This year twelve awards were given out. The Youth Achievement Award is given to a student who is unique in that they have not so much achieved academically or on the sporting field, but more likely have been a contributor to non-academic activities within the school and presented as a role model to other students. This award is unofficially called the ‘unsung hero’ award. 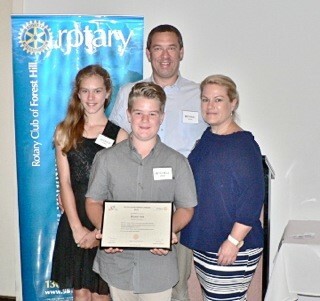 The 38th year awards were made at the Rotary Club of Forest Hill meeting on Monday November 28th at Buccatini restaurant. 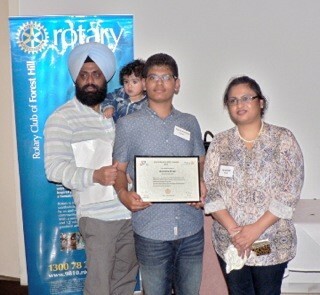 The Guest Speaker was Thanushi Peiris, who was Whitehorse Young Person of the Year. Her message was Seek Opportunities, Go Outside your Comfort Zone, if you Fail then Keep Trying. Bill Marsh read out citations, while President John and Assistant Governor Alma Reynolds congratulated each awardee and presented them with a framed certificate and a $50 voucher. The awardees parents and grandparents, brothers and sisters were also present to share in their achievement. 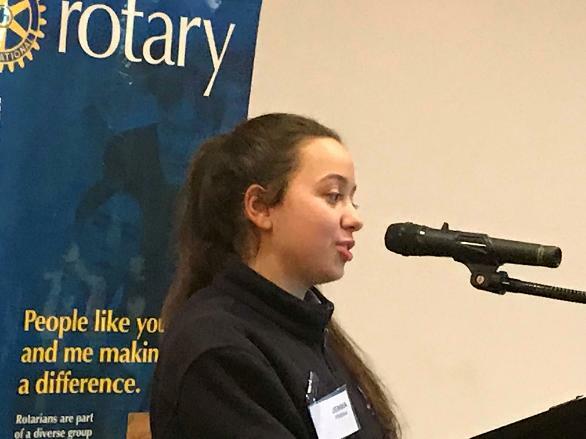 Speaker Jemma Frisina told us about the fantastic 2 day residential Rotary program RYPEN (Rotary Youth Program of Enrichment) that she attended, and how it impacted and focused her thinking and way of life. 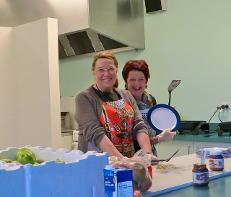 She said "I feel incredibly privileged to have been able to take part in this wonderful program. This year after being chosen to be a student group leader I can’t wait to help more participants like me to reach their full potential through RYPEN! I can’t speak of it highly enough"
Larry the Lorikeet officially flew into the hearts and minds of Victorian young children in August. Larry is the central character in a colourfully illustrated and cleverly written book designed to increase awareness of protecting the environment. 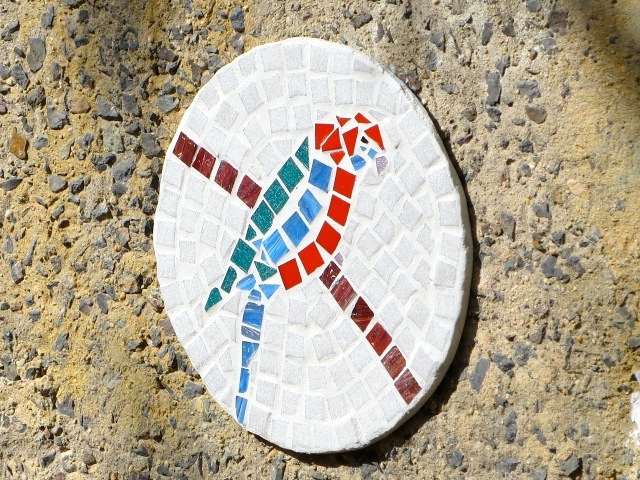 Symbolically, the tale traces the flight around Melbourne's iconic Blackburn Lake, preserve of a lorikeet who is forced to flee his home in the face of developer's bulldozers which have destroyed his habitat. 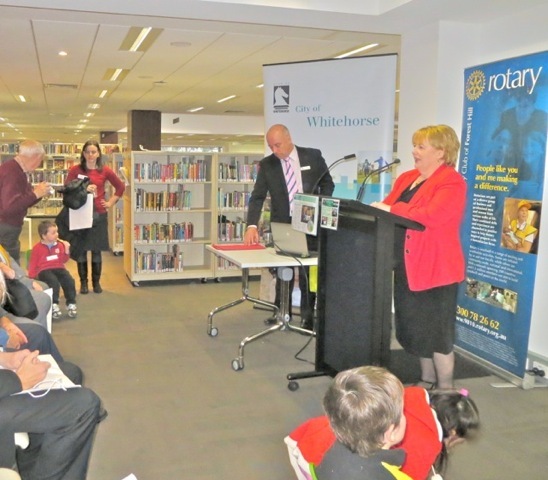 The project was initiated, project managed and financed by the Rotary Club of Forest Hill, supported by Whitehorse City council. 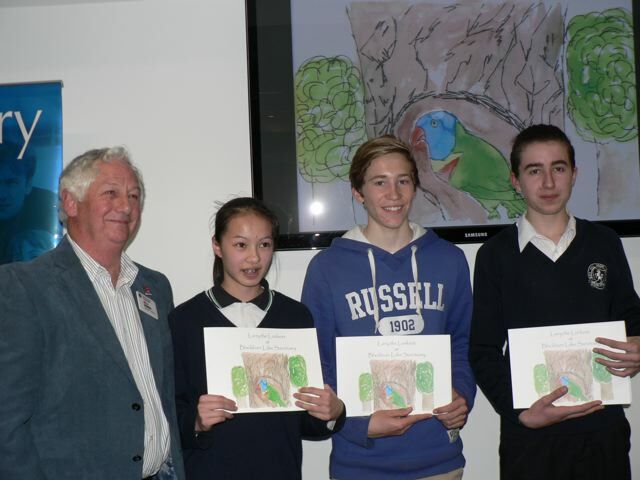 Forest Hill College led by Marianne McEwen, ran an art competition to decide the book illustrator. This was won by 14 year old student Zena who produced the book artwork. 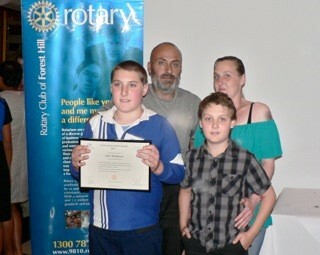 The story line and text came from Box Hill College student Adam with help from Liam and Brad. 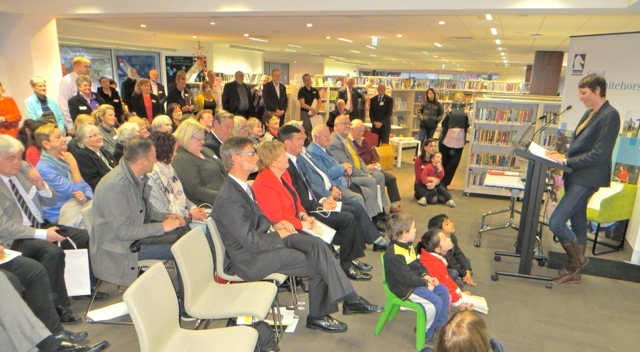 The book was launched at Nunawading Library by President Bill Marsh from the Rotary Club of Forest Hill in the presence of Mayor Cr Sharon Ellis, other councilors and State dignitories. 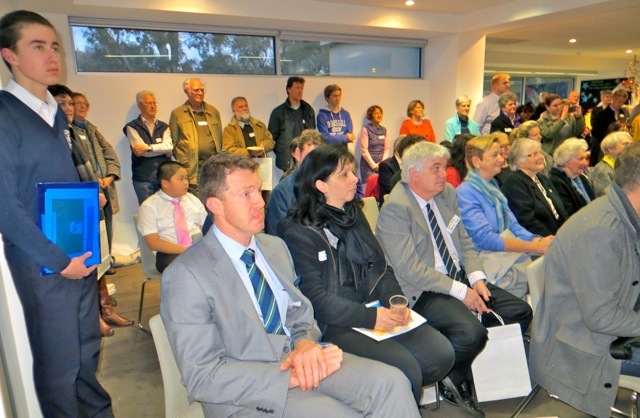 An audience of over 100 people listened to Lucy Menzies, The Lake Education Officer, read the book. Rotary distributed the book free to all local schools and libraries and Blackburn Lake where it will be used in the eduction program for pre schoolers. We encourage you all to read the book, and take your families to Blackburn Lake. On Friday 13th Feb 2015, we helped at the official unveiling of the "Great Wall" of Blackburn on the Lake Road retaining wall. 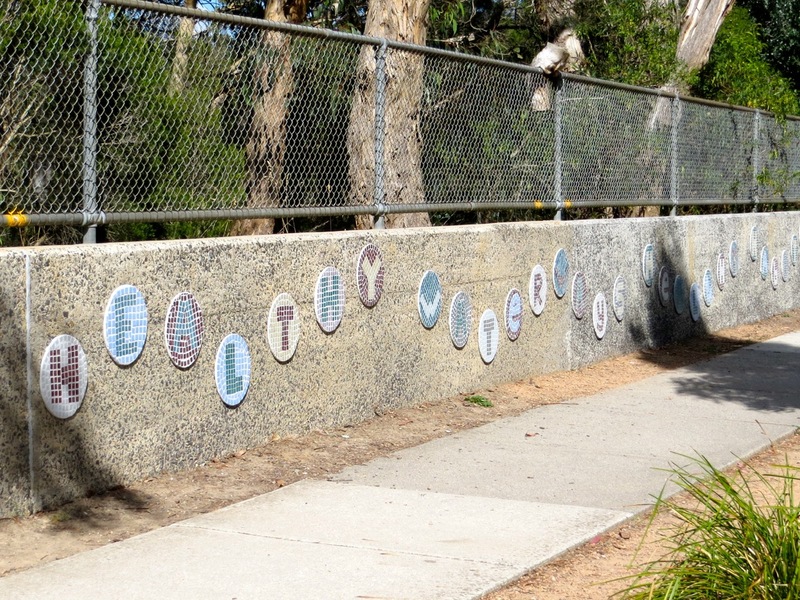 Local artist Lucienne Noontil designed the mural and students from Nunawading Christian College, Blackburn Lake Primary School and Forest Hill College created the murals. 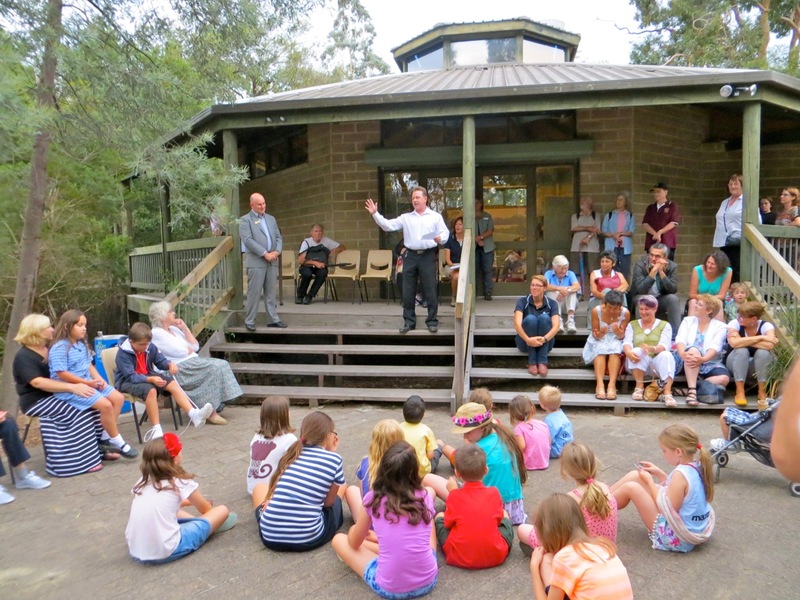 There was an excellent turnout of students, parents, Rotary Club of Forest Hill, Melbourne Water and Blackburn Lake Sanctuary personnel. 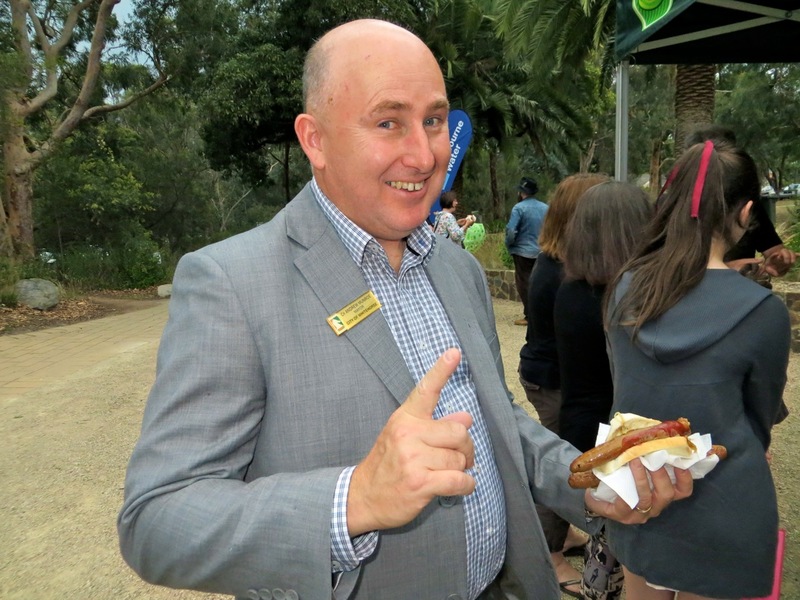 The Lord Mayor Andrew Munroe welcomed everyone to this great community event.